Put 2tbsp oil into a baking dish and add the carrots, parsnips, garlic and bay leaf. Stir, cover with foil, and bake for 20 mins. Meanwhile, put the onion in a microwavable container with a lid. Add 1tbsp olive oil, stir, place the lid on, and microwave for 4 minutes. Stir and cook for another 4 minutes. Set aside. I was really impressed with this method of getting caramelised onions! Unwrap and turn the vegetables. 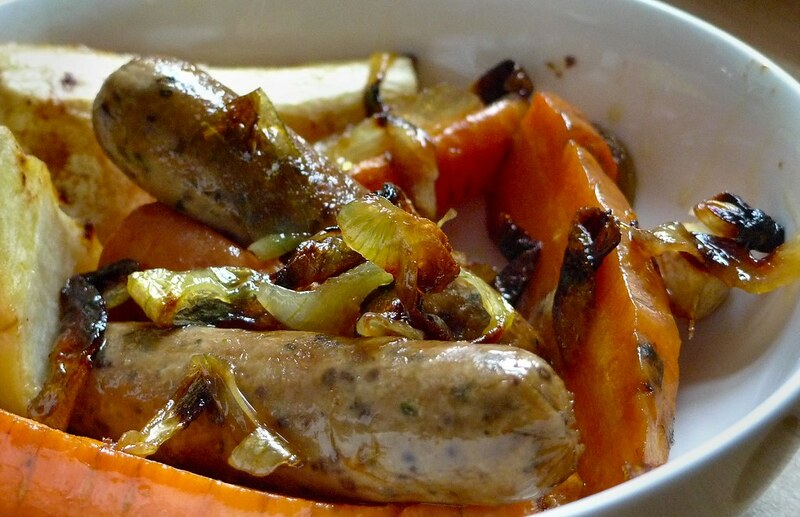 Add the sausages and onion, cover and return to the oven for 20mins. Unwrap and turn over. Increase the oven temp to 200C/gas 6 and cook the dish for a further 15mins. Serve immediately. add a lot more garlic! Cooked in their skins they were bursting with flavour and I felt cheated with only one!